Insurance Policies To Review When You Have A Baby: Insurance Says "I Love You"
As your family size grows, there is lots to prepare for and consider. Welcoming a new family member can be a joyous occasion, and requires some planning. Adding a new family member can affect your finances and create a need for more protections. 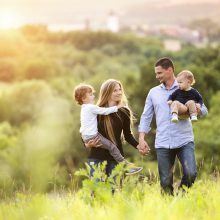 Reassessing your insurance coverage might not be at the top of your list, but policies should always be audited when changes in your family life occur to ensure your coverage will adequately protect your growing family. Remember this: insurance says I love you to the people you love. These are the insurance policies to review when you have a baby. If you’re growing your family and want to protect your loved ones, consider sitting down with us. As your Personal Family Lawyer®, we can walk you through creating a comprehensive Kids Protection Plan®. Before the session, we’ll send you a Family Wealth Inventory and Assessment that will get you thinking about what you own, what matters most to you, and how you want to protect your growing family. Schedule online.